Diode Dynamic LED Reverse backup lights for the FRS and BRZ. The Diode Dynamics LED upgrade for your reverse lights in the FRS and BRZ really brighten things up! Replace the dull halogen reverse/backup lights in the FRS and BRZ with an LED upgrade from Diode Dynamics. With 3 bulbs to choose from, you can make sure to have the perfect bulb for your needs. With brighter LED reverse lights, you will have an easier time parking, better visability and a huge visual increase of looks by getting rid of the dull yellow factory reverse lights. HP5: Slightly lower brightness than OEM bulbs, but still provides the crisp, modern instant on/off of LED technology. HP36: Slightly higher brightness than OEM bulbs. 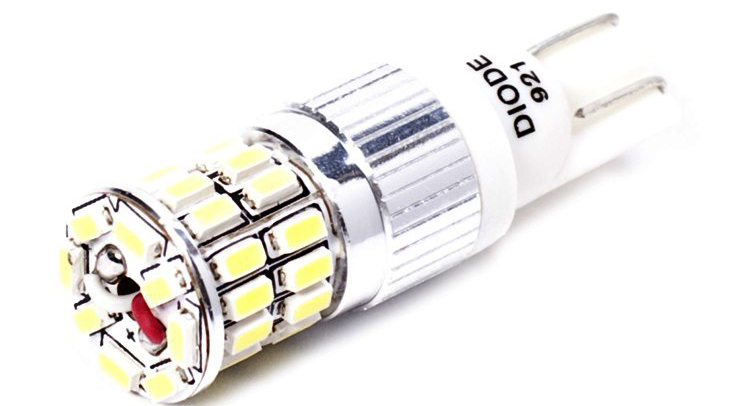 Backup LEDs are a direct replacement. Just change the bulb! You will not need any resistors or other accessories. 1. Access the bulb or tail light. You may need to pull back the trunk/cargo carpet and/or unscrew the visible nuts holding the light in. 2. Remove the backup bulb socket by twisting counterclockwise. 3. Remove the factory bulb from the socket. 1. Plug new LED bulb into socket by pushing it in fully. 2. Test the function of the bulb. If it does not work, remove it, rotate, and reinstall in the socket. 3. Insert socket back into place, and reassemble as necessary. That's it!